In present-day Silicon Valley, disruptive technology is the coin of the realm, no doubt because its business model is so simple: 1. Turn your competitors upside down. 2. Grab them by their ankles. 3. Shake vigorously until you are standing knee-deep in cash. Indeed, making money off other people’s ideas by identifying and developing an “unfair competitive advantage” has long been a sign of business acumen and ingenuity rather than mere charlatanry, even if the end products of such efforts are no more useful than a bottle of phony snake oil. The rich and colorful history of charlatanism and its somewhat more legitimate business cousins is showcased in a new book called Bizarre & Outlandish Gadgets & Doohickeys. Written by Maurice Collins and published by Schiffer, the 320-page volume is packed with the brainchildren of would-be disruptors who tried to make their fortunes between the years 1851 and 1951. Some clearly hoped to get rich quick at the expense of a credulous public, but others were guilty of nothing more than having a clever idea that once must have made sense but now seems quaintly out-of-date, usually because of its reliance on laughably archaic technology. 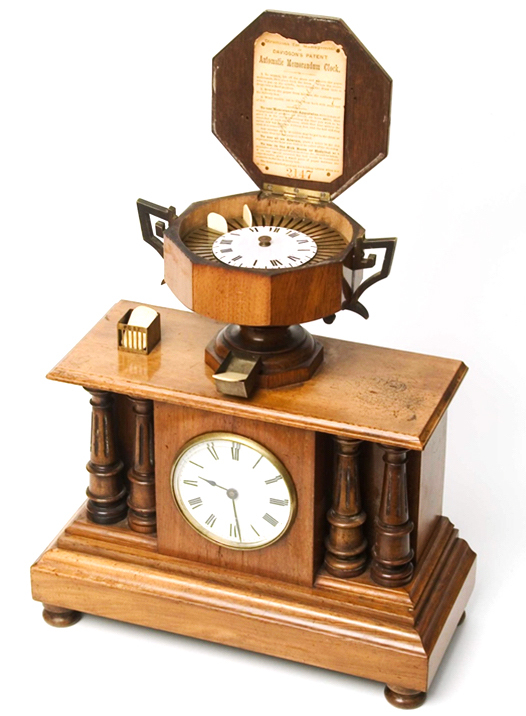 Top: The Memorandum Clock was used in lawyer’s offices, and perhaps houses of ill repute, to make sure a client does not overstay his welcome. 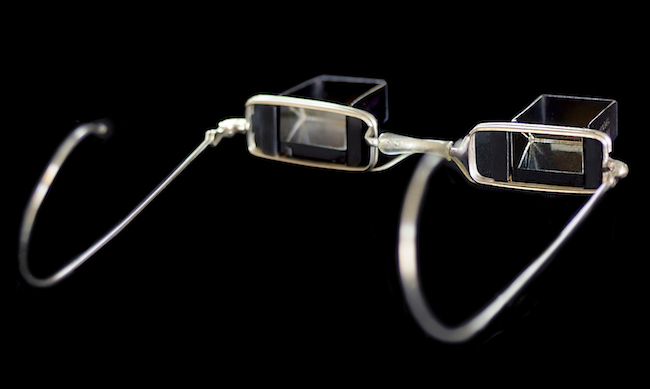 Above: Thanks to a pair of mirrors in the eyepieces, Laying Down Glasses allow one to read a book while reclining, without even raising the book from one’s lap. 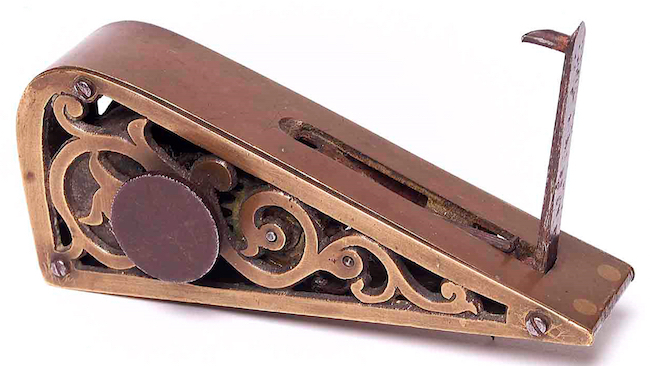 The fact that at least a few of the pieces in Collins’ collection were found in rubbish dumps should tell you something about the success of these relics as disruptive technologies, although, to be fair, most of the pieces Collins has amassed over the last 40 years have been purchased from antiques dealers. The pistol secreted in this lady’s clutch was only powerful enough to frighten or wound a would-be assailant. That’s certainly true of the Memorandum Clock, a handsome object from the late 1880s. “The photograph in the book doesn’t really do it justice,” Collins says of what appears to be a column-flanked mantel clock with a lidded kylix on top, all made out of fine hardwood. In fact, the photo at the top of this page is not in the book at all, but Collins agreed to share it with us since it reveals the interior of what is essentially a very elegant time clock. The Memorandum Clock is not an especially disruptive piece of technology, unless, of course, you’re a customer in one of those houses of ill repute. It’s just a timepiece, you might say, whose time was up. 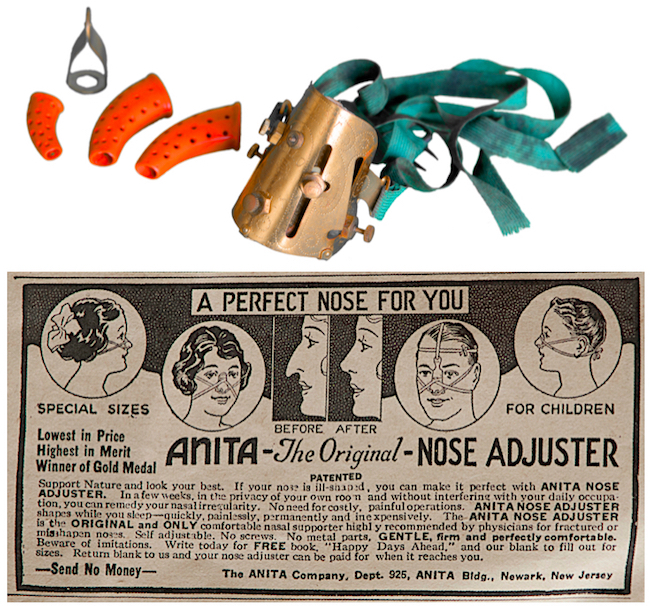 For a better example of attempted disruption, as well as good old-fashioned charlatanism, Collins directs my attention to the “Anita” Nose Shaper, which, he tells me, was “the ultimate in nasal quackery.” The Memorandum Clock, he notes with some pride, is an English item. “This is American,” Collins says of the Nose Shaper, with just a trace of judgment in his voice. The accompanying text claims a pinch of this Medicated Snuff can bring the drowned back from the dead. “They’re claiming to bring back people from the dead!”, Collins exclaims. 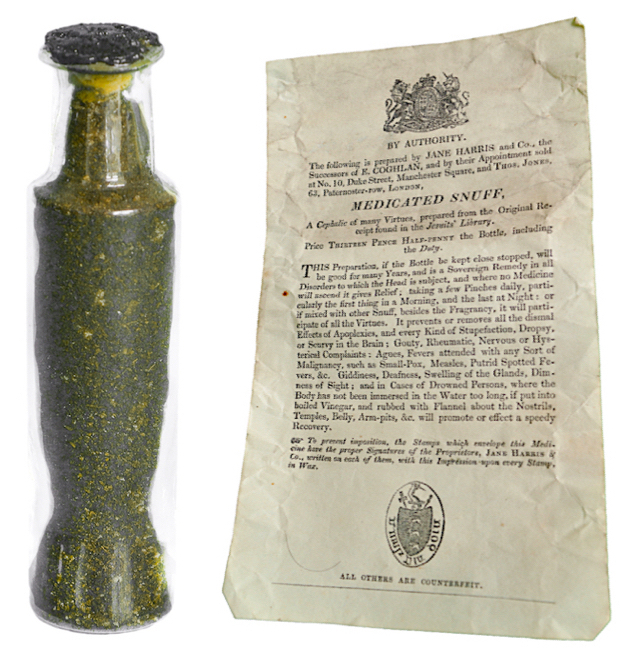 “Now, that is the ultimate in quackery.” According to Collins, the bottle was sealed when he bought it and remains so today, which means the secrets of its magical contents could still be revealed to a grateful world. 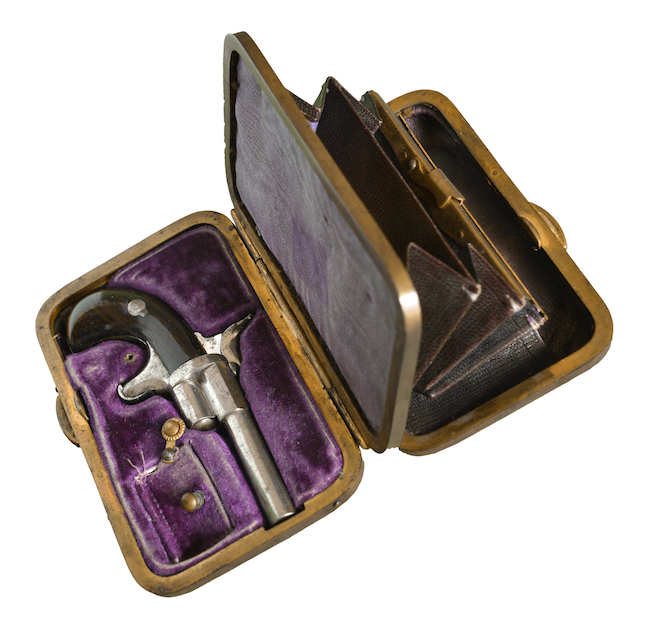 Elsewhere in Gadgets & Doohickeys, Collins introduces us to a Victorian Ladies’ Gun Purse, which looks like a small clutch but has a hidden compartment in it for a small-calibre pistol designed to scare or wound an assailant but not powerful enough to kill. “This one was produced in Scotland, probably in the 1880s,” Collins says. 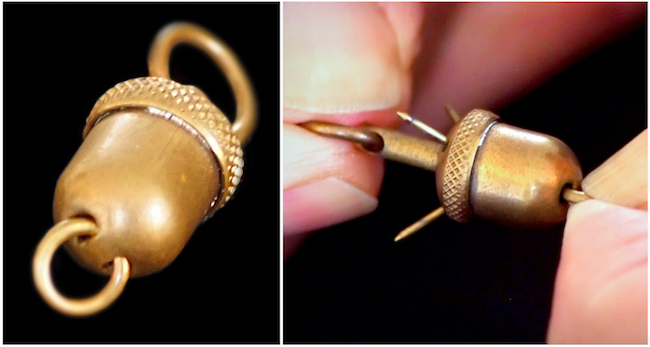 The barbs on this acorn-shaped pocket-watch fob were designed to catch on one’s clothing to foil the nefarious aims of would-be thieves. 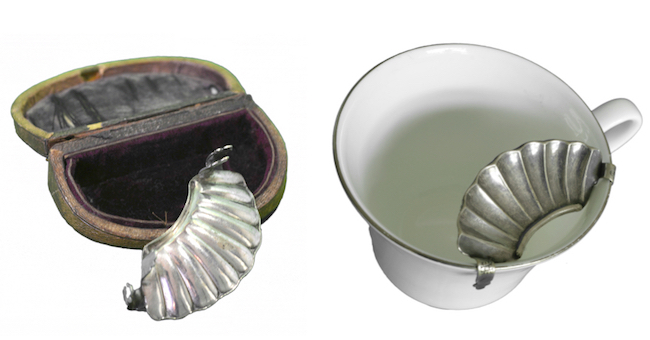 This portable mustache protector could be retrieved from its case and affixed to a cup to prevent the hair on one’s upper lip from egregious stains. 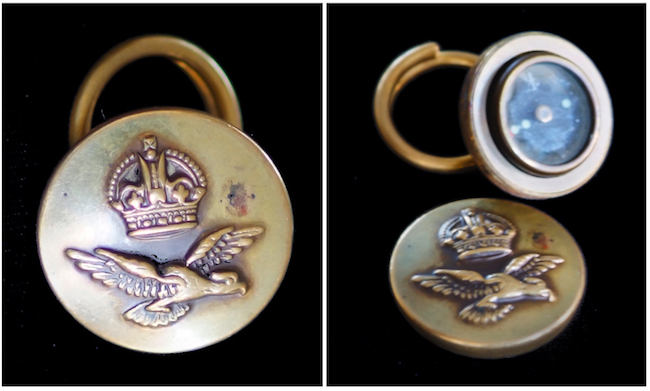 A compass hidden in an RAF crewman’s jacket button, circa World War II. This Thumb-Sucking Stopper appears to be in good working order, save the rust. That longevity has gained Collins quite a reputation locally. “I did a talk last night for charity—I do a lot of them, actually. As part of my talk, I always bring a box of perhaps 20 items. I spread them out on tables and ask people to guess what they are.” One of the items Collins had with him the night before we spoke was a Thumb-Sucking Stopper, which is one of those quintessentially bad Victorian Era ideas that exists only because an emerging technology—in this case, the ability to extrude wire—came along to make it possible. 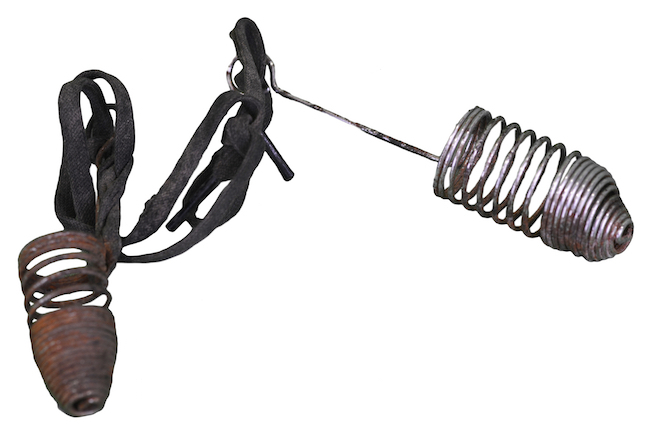 In the second half of the Victorian Era, wire-extruding technology was famously embraced by the barbed-wire industry, which needed a cheap and durable material to keep cattle at home on the range. That made sense, but the rust on one of the Thumb-Sucking Stoppers shows how ill-suited that same wire was to young, toothless tads. This Clockwork Burglar Alarm from 1880 would be triggered when a door was opened, forcing the lever down and releasing a catch that set off a loud bell. “ ” You’d go to get medicine, and the kindly pharmacist would offer you matches.